Crisp days and cool nights provide prime conditions for camping, hiking, mountain biking and even skiing—all without the peak-season crowds. Camping in the fall and winter in Colorado offers a unique experience. The changing aspens, cool nights, potential for fresh snowfall and abundant outdoor daytime activities ranging from hiking and mountain biking to skiing and snowshoeing, make this a great time of year to get out and explore. During the fall, you will enjoy beautiful days and crisp, clear evenings, and the cooler temperatures tend to thin out the summer crowds. As winter sets in and snow covers the peaks, some of the state’s most popular locations offer winter activities like snowshoeing, cross-country skiing, backcountry skiing, snowmobiling and sledding. 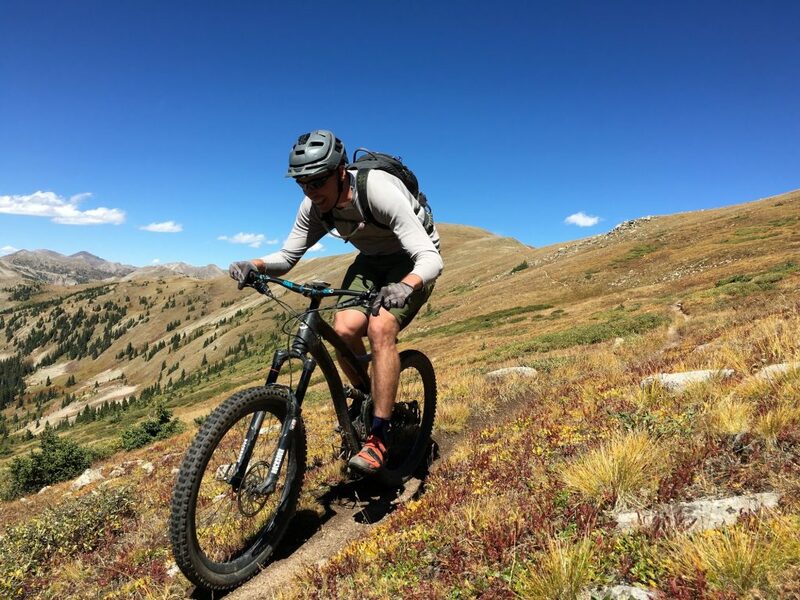 And for those looking for lower elevations and a drier climate, the Western Slope offers cool-but-not-cold weather and ideal trail conditions, making it an excellent place to spend a night or weekend out. Planning ahead for the weather regardless of season or where you are headed is key, so be sure to check the weather, roads and avalanche conditions prior to setting out. If you are planning to book a hut or yurt, be aware that you will need to make reservations well in advance, though many campsites will transition to filling on a first come, first served basis in the off season. Most campgrounds offer reduced amenities during the fall and into the winter, but this doesn't mean you have to rough it. With a little creative planning and the appropriate gear, fall and winter camping in Colorado is just as enjoyable as camping in the summer. Here are 10 recommended locations to get you started planning your next camping trip. Spanning two states and 329 square miles, Dinosaur National Monument is worthy of an overnight trip—especially during the cooler months. With its proximity to the winding Green and Yampa Rivers, the monument is a scenic setting for stargazing around the fire at a riverside campsite. During the day, you can head out for a hike, take a scenic drive, have a picnic or go river rafting in the early fall. Or, head across the state line to Utah, where the Quarry Exhibit Hall displays the interesting dinosaur fossils from which the monument derives its name. In the winter, bring along your snowshoes or cross-country skis. Snowmobiling is permitted near the southern end of the monument on Harpers Corner Drive between the Plug Hat Parking Area and the Echo Park Road turnoff, if you are looking to explore the park once the roads are snow-covered. On the remote Colorado side of the monument, visitors have their pick from three campgrounds—Echo Park, Deerlodge Park and Gates of Lodore. All three campgrounds are open year round as long as the dirt roads to access them are clear—once the snow starts to fall, it is best to plan on the roads being impassable due to snow or mud. Current conditions can be found on the park's website. All sites are first come, first served, and the campgrounds rarely fill, according to Amanda Wilson, Park Guide with Dinosaur National Monument's Interpretive Division. Each campground has vault toilets, picnic tables and campfire rings. "Visitors need to be prepared for changing weather and road conditions, and be more self-sufficient, as these campgrounds are quite a ways from the nearest services," Wilson says. The remote nature of the campsites gives them a more secluded, almost backcountry feel. A lesser-known destination for outdoor recreation, the Buena Vista area, located along Colorado Highway 285 corridor at the base of the Collegiate Peaks, is a popular summer and fall destination. With multiple USDA Forest Service-managed campgrounds in the area, you have a few overnight options. Particularly noteworthy is a stay at one of the campgrounds located in Chalk Creek Canyon where white, chalk-like cliffs and pine and fir trees dominate the scenery. While in the area, you can plan a trip to the nearby Mount Princeton Hot Springs, conveniently located a few miles up the road. If you are looking for less relaxation and more adventure, plan a day of hiking, rafting, kayaking or mountain biking in the fall. The Collegiate Peaks are home to challenging terrain and stunning scenery, and exploration of the San Isabel National Forest trail systems can easily fill a weekend. The Colorado Trail passes through the area as well, giving you the option for a long hiking or mountain biking excursion. History buffs can enjoy a trip to the historic ghost town of St. Elmo or you can pop into the nearby towns of Buena Vista or Salida for restaurants, shops and art galleries. Reservations at the USDA Forest Service campgrounds can be made up to six months in advance and are highly recommended as Chalk Creek Canyon’s popular and most accessible campgrounds do fill. The larger, drive-up campgrounds at Mount Princeton, Cascade and Chalk Lake offer a mix of reservable and first come, first served single-family campsites with basic amenities, as well as easy access to all the activities in the area. Sites are equipped with a picnic table and campfire ring, and amenities include vault toilets, hand water pumps and dumpsters. Be aware that water at the campgrounds can be turned off once the temperatures start to dip below freezing so you may want to call ahead if planning a trip later in the season. 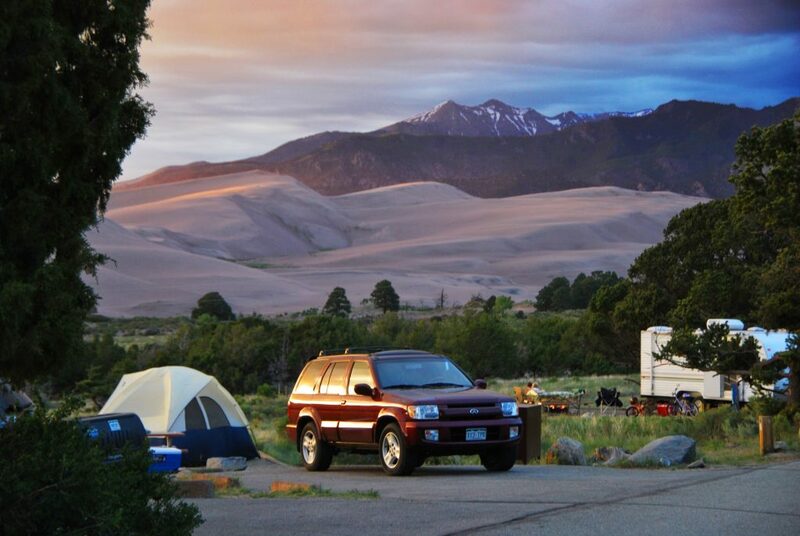 Though most people visit Great Sand Dunes National Park in the summer, the fall and winter present an equally opportune time to explore the area, and an overnight stay treats you to stunning stargazing from your campsite. As Katherine Faz, the park's Chief of Interpretation and Visitor Services, notes, "Great Sand Dunes is a perfect destination year-round. We encourage visitors to come in the fall and winter and to even consider staying after dark to experience dark skies." 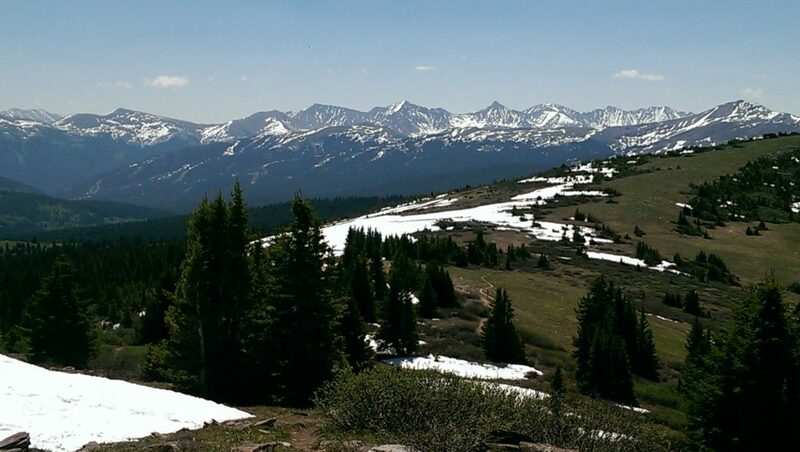 While the higher elevations and peaks of the Sangre de Cristo Mountains will be snow-covered, the San Luis Valley sees less snowfall and has drier conditions for camping and recreating later into the fall and during fair-weather conditions in the winter. Temperatures at night can get quite cold, so come prepared for wide temperature swings and shorter days, but if you are well prepared with a headlamp or lantern and plenty of warm gear, the cool, clear days will more than make up for chilly nights and frosty mornings. Piñon Flats Campground, located in the park itself, is open until November 1. Reservations are required and can be booked up to six months in advance. This campground is conveniently located across from the sand dunes and near the park's hiking trails. A hike up Mosca Pass Trail is particularly enjoyable as you climb up through small groves of golden aspens in the fall. Visitors with a four-wheel drive vehicle can take a scenic drive up Medano Pass Road for more fall colors. Once Piñon Flats Campground closes for the season, visitors can head up the road to the Zapata Falls Campground which is open year round and overseen by the Bureau of Land Management. Although a bit more primitive (no water, only vault toilets and access via a bumpy dirt road), roughing it at this campground provides easy access to a hike to the ice-encrusted Zapata Falls and stunning views of the sand dunes to the north. 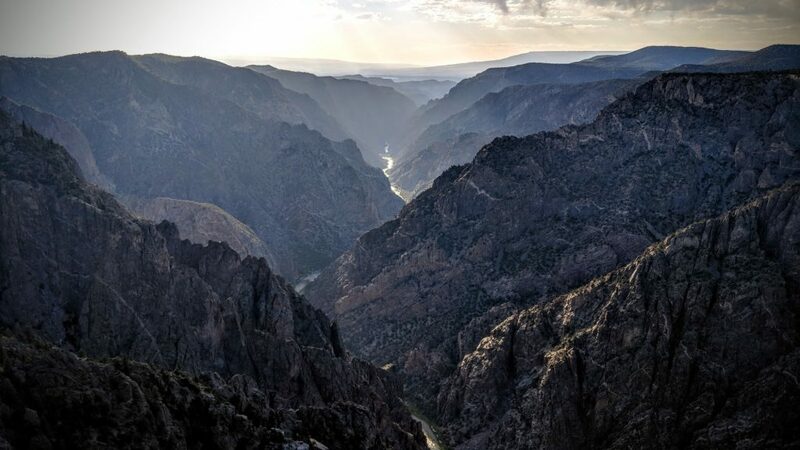 A trip to Black Canyon of the Gunnison National Park is worth it any time of year, but a visit during the fall or in the winter makes for a memorable outing. The fall is particularly pleasant, with cooler weather (the best months are September to mid-October) and prime conditions for hiking and rock climbing. During the fall you can still access the trails in the canyon, but once the park sees its first snowfall, access is prevented due to the dangerous and icy trail conditions. Snowfall in the region can vary greatly—in light years the trails can be dry well into the winter, but in heavy snowfall years, the park can see multiple feet of snow. "Bring lots of layers and everything from hiking boots to snowshoes," recommends Sandra Snell-Dobert, Supervisory Park Ranger at Black Canyon of the Gunnison National Park. In the winter, plan to come equipped with food and water, as there are no food services in the park. Once the snow begins to fall, South Rim Drive is not plowed in the winter, and the scenic 6-mile road, which is normally open to cars, transforms into a ski trail. The park offers three campgrounds that are open year round with reduced amenities and access in the fall and winter. Backcountry camping is also permitted (with a free wilderness use permit) along the closed road beyond Pulpit Rock Overlook. Although the campsites along the road are a bit exposed due to the scrubby pinyon-juniper landscape, the fantastic views of the canyon are unobstructed on a clear day. Bring your cross-country skis or your snowshoes to fully explore South Rim Drive. And, be sure to check out the park's winter activities page for more information on how to best prepare for your time in the park during the winter months. State Forest State Park is located in the northern part of Colorado to the west of Fort Collins. The region provides access to many miles of trail nestled in the mountains of the Never Summer and Medicine Bow ranges. The wide variety of terrain ranges from high alpine tundra to forested slopes of fir, spruce, pine and aspen, and the park is home to a variety of wildlife so keep your eyes open for moose, elk and deer. Whether hiking or mountain biking in the fall or sledding, skiing or snowshoeing in the winter, you will have plenty to enjoy during the day. A day pass is required to enter the park, and more information about the current fees can be found on the park's website. The Never Summer Nordic Yurts, a series of yurts and huts managed by Never Summer Nordic, are a idyllic place to spend a long fall or winter weekend. These rustic yurts give you all the best of a backcountry experience while providing you with a little more comfort than your average tent outing. Although you won't have electricity or running water, the yurts do provide the comforts of rustic furniture, wood-burning stoves, a kitchen stocked with a propane cooking stove, propane, pots, pans, dishes and silverware, a lantern, an outhouse and a bit more insulation between you and the chilly fall and winter nights. The Dancing Moose and Medicine Bow yurts are easy to access, making them ideal for families or first-time campers. Visitors looking for more advanced skiing or mountaineering have their pick of several remote yurts, like the Ruby Jewel Yurt and Clark Peak Yurt, which require a longer hike in and access to backcountry stashes and powder skiing in season. The higher elevations of the park usually have the best snow coverage from January through March. These yurts are extremely popular, and book well in advance. Reservations are required for any overnight stays, and it is recommended to plan your trip early to ensure availability. Shrine Mountain Inn consists of three cabins that are privately owned and operated as part of the 10th Mountain Division Hut Association. In the fall, you can hike to Shrine Mountain along the Shrine Ridge Trail, which features beautiful views of the Gore, Tenmile and Sawatch mountain ranges. In the winter, you can ski or snowshoe the trail before returning to your hut to prepare a hot meal and put your feet up by the wood-burning stove. For families with children who can handle the distance and beginners who are comfortable on snowshoes or skis, these cabins are recommended as one of the easiest-to-access 10th Mountain ski-in huts and make a great first-time winter hut trip. The three huts—Jay's, Chuck's and Walter's— sleep 36 people total. Reservations are required and can be booked in advance through 10th Mountain by calling 970-925-5775 or via an online portal. Located on Vail Pass, these accommodations are open year-round, and feature modern amenities such as running water and propane grills, in addition to the outright luxury of a wood-fired sauna located between Jay's and Chuck's cabin. 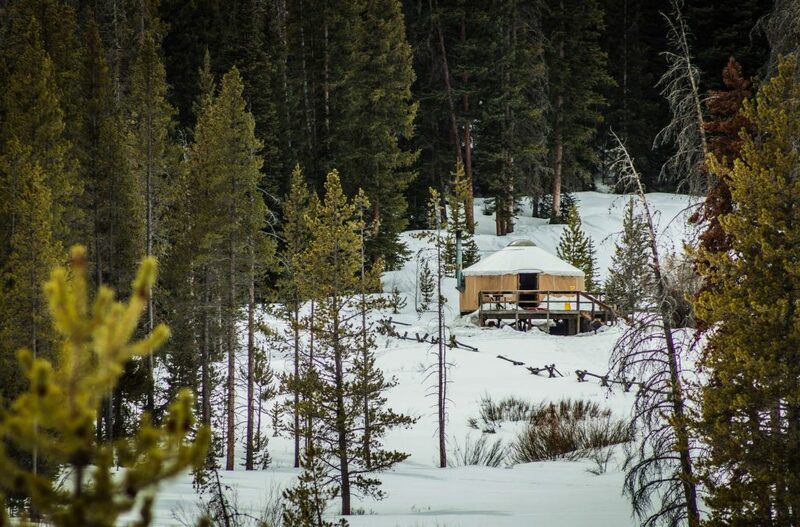 If you enjoy the amenities of Shrine Mountain and are looking for other options in the state, be sure to check out the range of huts, yurts and cabins offered for reservation by the 10th Mountain Division Hut Association. 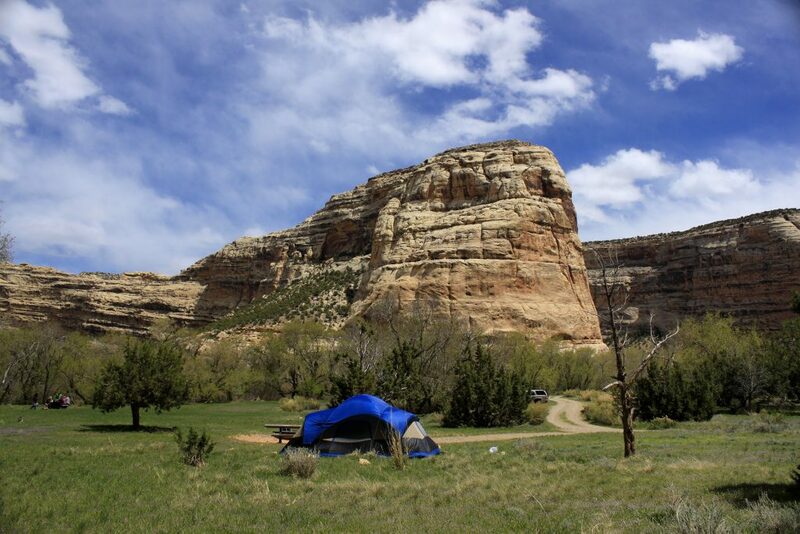 Situated on the westernmost edge of the state, Colorado National Monument is home to the 80-site Saddlehorn Campground, which is open year round and is a great jumping off point for a long weekend or vacation at the monument. The monument's elevation ranges from 4,000 to 7,000 feet, and this arid, semi-desert environment means that the temperatures tend to be more mild and the snowfall less severe during the fall and winter months. The drier climate makes the trails a good option for hiking. Road biking through the monument is also a popular fall activity as the heat of summer gives way to more temperate days. Or, you can head out for a scenic drive along Rim Rock Drive (be aware that the road can be closed in the event of snow or ice). Rock climbing, star gazing, birding and cross country skiing are all popular activities in the park as well. The campsites at Saddlehorn Campground range from smaller tent sites to larger pull-throughs, and most are equipped with picnic tables, charcoal grills and a parking area. The large campground does not have electric hookups or showers, and wood fires are not allowed anywhere in the monument. Through October, certain sites require reservations and other sites are first come, first served throughout the year. 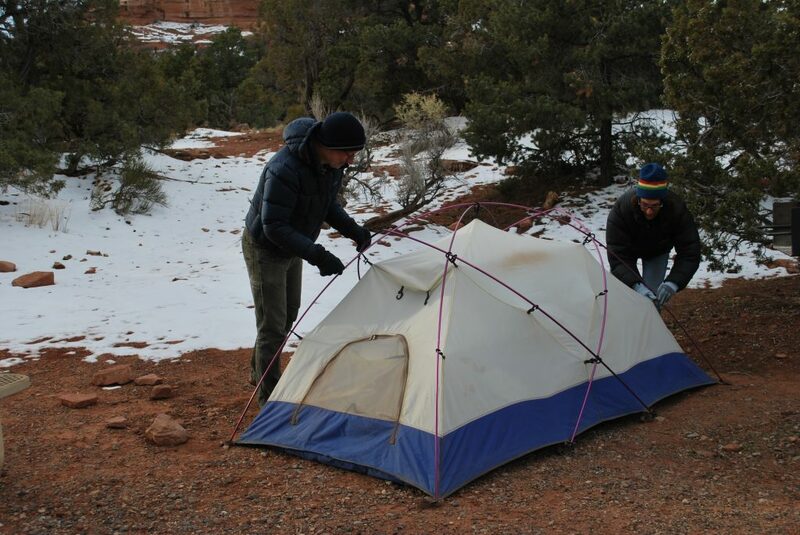 Backcountry camping is also available in Colorado National Monument with a free wilderness permit. 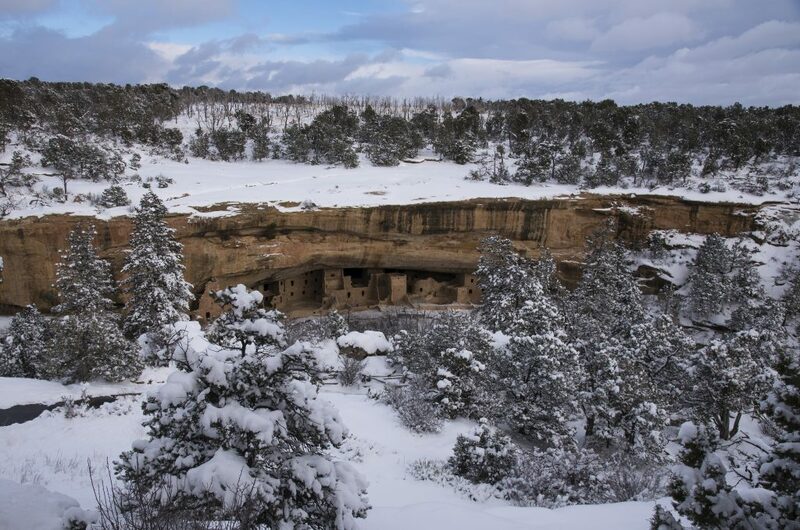 Tucked in the southwestern corner of the state near the Four Corners, Mesa Verde National Park is a geographically and historically diverse location. The park, which was designated as a World Heritage Site in 1978, is home to more than 600 cliff dwelling sites and 5,000 known archaeological sites. The sites are stunningly well preserved, showcasing the history of the Ancestral Pueblo people who lived in the region from 600 to 1300 CE. Although the weather tends to be milder than some of the snowier regions of the state, night temperatures can drop below 20 degrees in winter. The park’s campground provides unrivaled access to several outstanding hikes, including Point Lookout and the Prater Ridge Trail. In addition, you can easily drive south to take a tour of the cliff dwellings—note that most of these sites close in September or early October, so be sure to time your visit according to the sites you wish to see. If you are outside of the peak season, you can still enjoy fall hiking or bring your mountain bike for a day on the fun and swooping trails at Phil's World. Once the park has seen its first snowfall, check out the options for cross-country skiing and snowshoeing. Given its distance from the major metropolitan areas in the state, you will definitely want to extend your trip to Mesa Verde with an overnight stay or an extended vacation at the park's campground. The 267-site Morefield Campground is located on the north side of the park and is fully open from mid-April to mid-October. Off-season camping at Morefield is available the remainder of the year with more limited amenities. You have your pick of 10 trailer or RV sites, including 15 sites with full hookups for RVs that require reservations. Visiting Rocky Mountain National Park in the winter is a unique adventure. As the the golden aspen leaves disappear and the snow begins to fall, the crowds taper off. Visitors willing to brave colder temps and snowy weather are rewarded with a very different park experience. 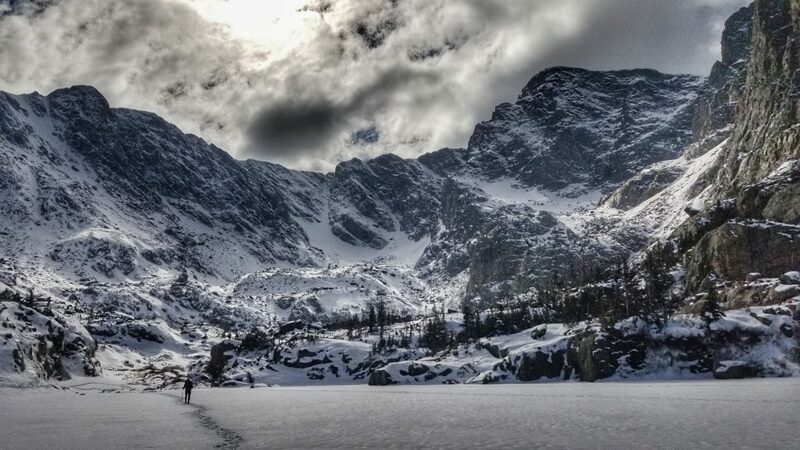 There are an abundance of winter activities to do in Rocky Mountain National Park from snowshoeing to technical backcountry exploration (be sure to check the avalanche conditions before heading out). As you explore, keep an eye out for deer, elk, moose, bighorn sheep and coyotes which tend to migrate to lower elevations during the colder months. Popular winter routes include the trail to Dream Lake and Sky Pond. Trail Ridge Road is closed during the winter, so access to the Moraine Park campground is only via the eastern side of the park through the town of Estes Park. Trail Ridge Road and Old Fall River Road, once snow-covered, are an easier option for beginner backcountry skiing. Frontcountry camping in designated sections of Moraine Park is available year round, although the amenities are limited (potable water is available, but from a single spigot, and in winter you will trade flush toilets for vault toilets). No reservations are required; the 64 available campsites are filled during the winter on a first come, first served basis. The truly adventurous can head into the backcountry to camp, after obtaining a permit, to see the park as never before. Prior backcountry experience and familiarity with navigating in avalanche terrain is necessary if you are planning to venture beyond the popular winter-use areas. Located west of Boulder, Brainard Lake Recreation Area makes for a pleasant weekend or weeknight trip if you are looking for Front Range camping close to town. Fall can be quite crowded, and you will need a permit in order to backpack into the Indian Peaks Wilderness. However, once the gate on the Brainard Lake Access Road is closed for the winter (usually some time in October after the first significant snowfall), the area quiets down. With trails marked for snowshoeing, cross-country skiing and fat biking, there are many ways to enjoy the region. 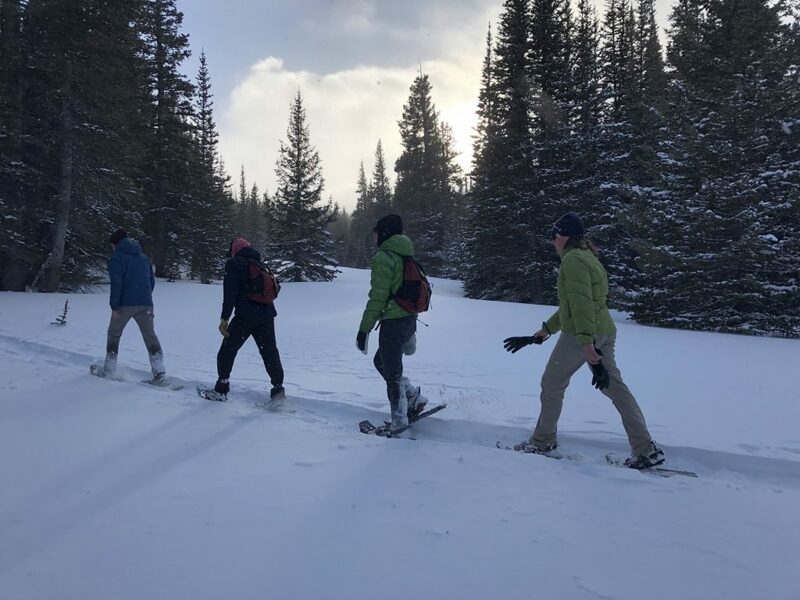 In addition to the marked trails, more experienced skiers can venture further into the backcountry to access the trails and slopes of Indian Peaks at the western edge of the recreation area. The winter camping at Brainard is dispersed, which means you won't find any amenities, but you’ll enjoy plenty of solitude. Access to the area is free in the winter (mid-October through late June) via the Brainard Gateway Trailhead, and presents a unique opportunity to camp in an area that is otherwise closed to backcountry camping during the remainder of the year. From the trailhead, you can hike in to set up camp, keeping in mind that your campsite must be a quarter mile away from any of the developed sites like Pawnee Campground, as well the area’s picnic areas and trailheads. Once you set up camp, be sure to explore the designated winter-use trail system. Not sure why you identify Bear Mountain as being in Canaan, when it’s actually in Salisbury. Thank you for your comment. Strangely we can’t find Bear Mountain or Canaan in this article. Were you commenting about another article? We’d like to fix our mistake!